Hildegard of Bingen (born Bemersheim nr. Alzey 1098; died 17 September 1179) was a German writer, composer and mystic. She was an abbess who is well known for her literary works and her songs. She also wrote about medical and scientific things, and wrote letters to many important politicians. Hildegard was born into a noble family. Her parents sent her to a monastery because she was the tenth child of the family. She took the veil (became a nun) at the age of 15. By the time she was 38 she had the title of “mother superior”. She founded (started) a monastery on the Rupertsberg in the Rhine valley near Bingen. Later she founded a daughter house on the other side of the river near Rüdesheim. She travelled a lot and talked to many important people. She later had the title of “abbess”. After she died several popes suggested she should be made a saint, but this never happened. She does, though, have a feast day on September 17, which is celebrated in some parts of Germany. 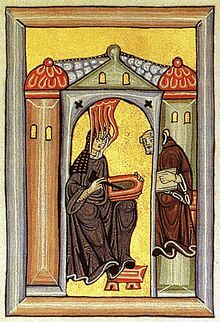 Known as the "Sybil of the Rhine", Hildegard had many visions, many of which she wrote down.They were mostly about God and his relationship with humans, the church, redemption from God, and creation. She wrote lyrical poetry which was very colourful and had lots of visionary ideas. Her music does not use plainchant like the music of many other medieval composers at the time. It mostly has small patterns of melody which are repeated many times in slightly different ways. Her music was also different because the chants she wrote were written for female voices, in a higher range than earlier chants. This made them easier for women's voices. She wrote a morality play in verse with 82 melodies. Hildegard of Bingen is the first composer whose life we know about. She may possibly be the first woman to write about female sexuality. ↑ 1.0 1.1 1.2 1.3 Kristina Lerman,. "The Life and Works of Hildegard von Bingen (1098-1179)". Fordham University: The Jesuit University of New York. Retrieved 18 November 2014. This page was last changed on 14 January 2019, at 13:53.